Hello all. I joined the Daring Bakers this month. In case you don’t know, the Daring Bakers are a group of amazingly talented men and women. Each month, a new baking challenge is released and the DBs all help each other to complete the challenge and then reveal the challenge and the results on the same day (which would be today: May 28). This month’s challenge was… an Opera Cake! To be honest, I had never even heard of this cake before, but after googling a few images of it, I was better able to figure out a way to attack and veganize the recipe. This challenge is dedicated to Barbara at http://winosandfoodies.typepad.com/. Barbara is the driving force behind A Taste of Yellow, which is a food blogging event that supports Lance Armstrong’s livestrong foundation. If you are unfamiliar, I strongly encourage you to check out her blog and see what she and A Taste of Yellow are all about! As you can see, I had some issues with the buttercream and syrup. Normally, I would be disappointed. But, as I have just started baking vegan, I am going to forgive myself these little mishaps. I think I should have chilled everything longer… Anyway, the cake (despite appearances) was fantastic! I managed to successfully substitute the massive amounts of egg and still have a delightfully spongy joconde. For that, I was very proud. I’m not going to post a recipe, because if followed it will most likely produce a similar result. 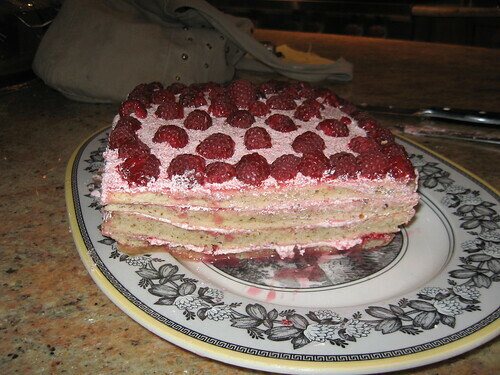 The original (non-vegan) recipe, along with some very beautiful pictures, can be found here: http://www.sugarlaws.com/opera-cake/#more-503. Congratulations to every Daring Baker out there for completing this challenge and good luck to any non-Daring Baker that wants to try the recipe out as a self-challenge. To all you Daring Bakers out there: if anyone has advice on how to put the logo on this page, I would very much appreciate it. Congratulations on completing your first challenge!! Your cake looks great! Congrats you made it through your first Challenge and to make it vegan to boot! Brave, very Brave you are! Great job! Yours looks great, me, I had some problems! I still haven’t figured out how to get the DB logo on my wordpress blog (they don’t allow embeded text in the widgets), you can however upload it like a picture for your post. Congratulations on your first challenge. What a challenge it was. Your cake looks ooey, gooey, and delicious. Yum! Yours looks great and I’m impressed with your veganizing the recipe!! One of my favorite flavor combinations! Congrats on your first challenge! great job veganizing. And as for the logo, after your first challenge, or right before, one of the two ladies (Lis or Ivonne) will email it to you. And, then you put it in like any jpg. Does that answer your question? You did a wonderful job on your cake. It’s beautiful. Congratulations on your first challenge! This was a hard one to veganize, I sadly never finished mine. 😦 I love the pink, it looks great! Great job on your cake, it looks really good. Good job with the veganizing as well, this one wasn’t simple. Congrats on your first challenge. It was indeed a challenge too. 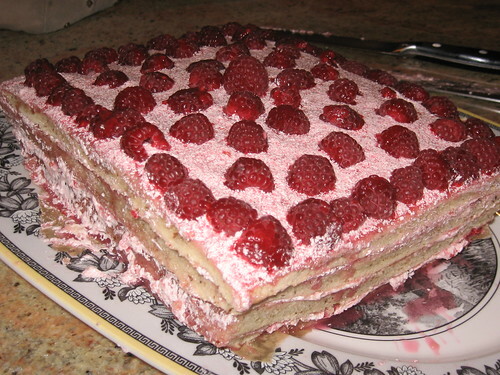 Your cake looks delicious with all the raspberries on top. Your first challenge? What a doozy. Way to go! Good job on the first Daring Bakers challenge. Love the raspberries. Wow! Your cake looks yummy. I like your idea of using raspberries to decorate the top… my opera cake looked pretty simplistic 😛 Congrats on your first DB challenge… looking forward to seeing what next month has in store!